Anti-Brexit protestors demonstrating in Brighton, England. Let’s face it, United Kingdom: The dream of separating from the European Union has blown up. Hold a new referendum to stay in the EU, and vote the correct way this time around. Many in the UK are having serious second thoughts about the 2016 vote to leave the European Union — not unlike the way at least some Donald Trump voters are realizing they made a big mistake in November 2016. 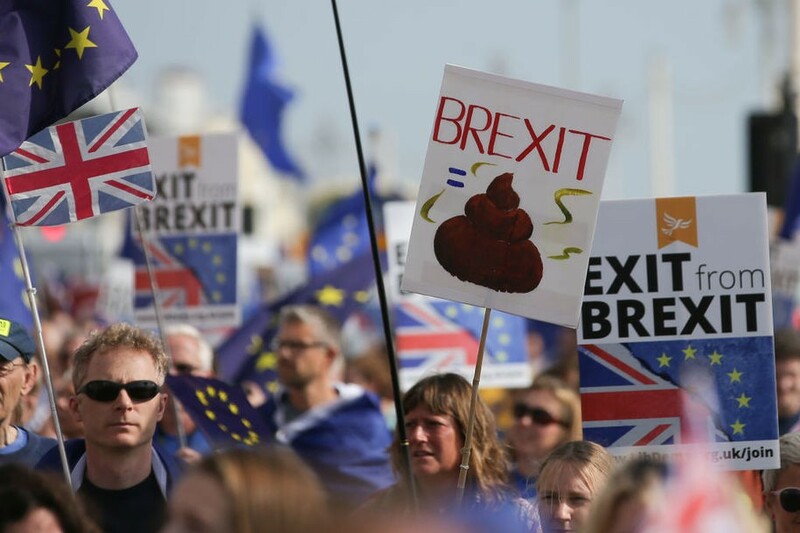 The results of the June 2016 Brexit referendum were surprising, as many polls suggested that the “Remain” supporters outnumbered those on the “Leave” side, albeit slightly. But the vote on Brexit went the other way, 51.9 percent to 48.1 percent. Never mind the fact that leaders of the Leave campaign have admitted that many of their statements about the EU and the benefits of leaving it were outright lies. Never mind that much of the Leave campaign was driven by Russia. Never mind that there was no methodology for how to leave. Never mind that “What is the EU?” became one of the most-Googled queries in the UK after the vote. No matter. The vote to leave won over the vote to remain. But it’s not the way the majority of people in the UK feel now. There is now sentiment for a do-over. The disparity is wide, and it’s growing. A new Eurobarometer survey shows that if a new referendum were held, over half — 53 percent — of people in the UK would vote to stay in the European Union, with only 35 percent indicating that they still wanted out. Die-hard “leavers” who thought leaving the EU would mean an improved British economy are beginning to realize that their idea was nothing but “a fantasy island unicorn model.” (One May ally went so far as to say it was time to “shoot the unicorns.”) On the other side, die-hard “remainers,” seeing what a catastrophe either the current Brexit pact or a “hard Brexit” would be, want a new vote. And many Brits are so sick of the whole issue that they just want it to be over. The question is: Will leaders in the UK take the obvious way out of this disastrous situation and call for a new vote? To save their country’s trade and economy, even if it costs them their own political skins? The negotiations over exactly how the UK would leave the EU have been a mess. After two years of bargaining, Prime Minister Theresa May finally returned to Parliament with an agreement in hand, but it quickly became obvious that it would lose. May was forced to cancel a vote for Parliament to approve her Brexit deal, as it “would be rejected by a significant margin,” as May herself admitted. With support draining away, some of her fellow Conservatives forced a vote of no confidence. May survived, but she emerged as a weaker leader and had to promise not to run again as leader in the next scheduled general election in 2022. This was on top of the House of Commons voting that the government was in contempt of Parliament for failing to publish texts of its full legal advice on Brexit. An absolute Brexit deadline is coming up on March 29, 2019, only a few months away. And a “hard Brexit,” that is, a cutting of the EU cord without details worked out on trade and other matters, could be disastrous for the UK. The EU is trying to give Brits an easy out. The European Court of Justice ruled that the UK can cancel its Brexit decision without the permission of the other 27 EU members. See, Prime Minister May? They’re trying to help. Liz Saville Roberts, a member of Parliament from Wales, urged May to take advantage of the court’s ruling, saying it was “the prime minister’s gift to personally take Brexit off the table.” But May and her Tory government have abandoned the idea of taking such a step, even though the UK could still keep all its existing benefits, including its rebates, its opt-outs, and the pound sterling. Angela Merkel, the German chancellor, has said that she has “no intention of changing the exit agreement.” Jean-Claude Juncker, the European Commission president, expressed similar sentiments, saying there is “no room whatsoever” to amend the treaty. One of the biggest sticking points in Brexit negotiations involves the border between Ireland and Northern Ireland. Leave voters apparently didn’t consider the potential problems that might occur on that border, where travel and trade are currently unhindered. It’s a border that isn’t really a border — until it might have to be, once again. Neither the UK nor the EU wants a hard border. The current Brexit agreement has a “backstop,” or a safety net of last resort, that basically kicks the can down the road over rules regarding trade and other matters until after the final Brexit separation goes into effect. The purpose is “maintaining cross-border cooperation, supporting the all-island economy, and protecting the Good Friday peace agreement,” according to a BBC Q&A explaining the idea. The deal also would keep the UK in a “customs union” when it comes to Ireland. But critics charge that it means Britain would be neither fully in nor fully out of the European Union, and it would have no say in future trade rules. In the worst-case scenario, a hard Brexit could trigger a 30 percent tariff in Irish trade. There are some 200 roads crossing from Ireland into Northern Ireland along the 499-kilometer, or 310-mile, border (they use different measuring standards). Today, few roads have signs announcing the end of one country and the start of another — we see more signage driving from one state to another here in the U.S. The Irish travel to and fro without showing a passport. Euros from Ireland and pounds sterling from the north are both accepted in border towns. Businesses trade freely with those on the other side of the border. Residents cross regularly for medical care. Sheep and cattle graze on farms on both sides. “Up to 35,000 people commute across the border every day,” says a story by the BBC. During the days of the Troubles, or the time of violence and tension in Northern Ireland in the late 20th century over British rule that left some 3,600 people dead, there were British military security checkpoints along the border. Armed soldiers patrolled across watchtowers and added spikes to secondary roads, forcing drivers to cross only at a military checkpoint. Cars waited in long lines to cross in either direction, and drivers often had to open their car trunks (or “boots”) to show that they weren’t carrying weapons. The Troubles ended officially in 1998, and no one in either Ireland or Northern Ireland wants a return to those times. The Irish sketch comedy group Foil, Arms and Hog have a clear explanation of the problems with Brexit, especially how it would affect Ireland and Northern Ireland. May is trying once again to renegotiate aspects of her current deal, specifically details about Ireland and Northern Ireland. The rest of Europe already has said no—a deal’s a deal. May is in a weaker position, since so many members of her own party voted against her in the no-confidence vote (200-117). She’ll lose those votes, plus the 10 Unionist Party votes from Northern Ireland that are part of her coalition, and the votes of the opposition in a Brexit deal vote. She has now scheduled a vote in mid-January, but it’s not likely to pass. She has set a deadline of Jan. 21, 2019, for an absolute vote. But look how she backed down before. There are calls to postpone the Brexit date to allow more time to renegotiate. This, too, has met with rejection by the other 27 countries. If the deal can’t pass, if there can’t be a postponement, and no one wants the nuclear option of a hard Brexit, many are now concluding that a new vote might be necessary. Such a referendum could be the simple options of Leave or Remain, as in 2016, and Remain could very well win this time around. Or it could offer options of staying in the EU, approving the current Brexit deal, or taking the hard Brexit. If one of those options gained only a plurality—say, staying in the EU—those on the losing sides would be furious. That would include voters and politicians. Here’s what the UK needs to do. Either take the easy way out offered by the European Court of Justice and reject Brexit or listen to public sentiment and the People’s Vote campaign, which is seeking a new referendum with a Leave/Remain question. The campaign has support from many MPs and other representatives from multiple parties: Labour, the Scottish National Party, the Liberal Democrats, the Green Party, and Plaid Cymru in Wales. The Brexit vote was called the one of the dumbest votes ever taken, until the U.S. elected Donald Trump as president. Ultimately, it’s just like in this country: Be careful about who—and what—you vote for. Originally posted on Daily Kos on Dec. 16, 2018. UPDATE: Prime Minister May scheduled a vote for Jan. 15. She warned that unless Parliament approves her Brexit deal, there will be no Brexit at all. May lost the Brexit vote by a 2-1 ratio. She again survived a vote of no confidence in Parliament, but the way forward remains unclear. Meanwhile, the rest of Europe is as confused as the British people themselves on the next step. Enough already. Just schedule a new vote. NEW UPDATE: The latest in the never-ending Brexit saga is that the EU has agreed to a new Brexit delay until Oct. 31, or Halloween. It could be more ominous. The EU could have given the date of Nov. 5, Guy Fawkes Day, the anniversary of the date in 1605 when Guy Fawkes and his cohorts plotted to blow up the Houses of Parliament with barrels of gunpowder hidden in the basement of the House of Lords. The Gunpowder Plot failed. But Parliament seems to be blowing itself up all on its own.